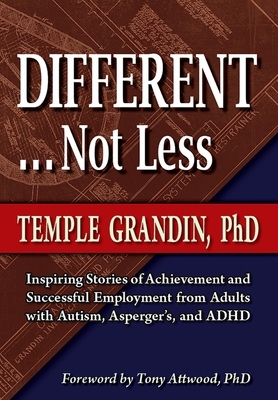 Temple Grandin offers the world yet another great work, an inspiring and informative book that offers both hope and encouragement. One of Temple's primary missions is to help people with autism, Asperger's Syndrome, and ADHD tap into their hidden abilities. Temple chose these contributors from a wide variety of different skill sets to show how it can be done. Each individual tells their own story in their own words about their lives, relationships, and eventual careers. The contributors also share how they dealt with issues they confronted while growing up, such as bullying, making eye contact, and honing social skills. Temple Grandin (born August 29, 1947) is an American doctor of animal science and professor at Colorado State University, bestselling author, and consultant to the livestock industry on animal behavior. As a person with high functioning autism, Grandin is also widely noted for her work in autism advocacy and is the inventor of the hug machine designed to calm hypersensitive persons.Grandin is listed in the 2010 TIME 100 list of the 100 most influential people in the world in the category "Heroes" Tony Attwood (born 9 February 1952, Birmingham, England) is an English Psychologist who lives in Queensland, Australia and is an author of several bestselling books on Asperger's Syndrome. He speaks on autism and Asperger's Syndrome around the world.His book, Asperger's Syndrome: A Guide for Parents and Professionals has now been translated into 20 languages.Attwood also has a clinical practice at his diagnostic and treatment clinic for children and adults with Asperger's Syndrome, in Brisbane, begun in 1992. This is an inspiring book. The stories of achievement will be encouraging for parents of a young child with an autism spectrum disorder and will be especially inspirational for adolescents and young adults who are feeling despondent that autism could deprive them of a successful career or relationship. This book has antidepressant qualities to rival those of medication.